Since I’ll probably forget to write these down later, I’ve decided to post them here to both remind myself of what I need to accomplish in 2010 and to try to determine which I will actually be able to accomplish. Some of these are slightly out of my control, but that doesn’t mean that they aren’t resolutions, right? I’m applying for three different internships for this coming summer, each of which will last two months and all of which are centered on Physics/Astrophysics/Space/etc. The first two are REUs (Research Experience for Undergraduates) at American universities. I’m looking at the Physics/Astrophysics REUs at the University of California-Davis and Notre Dame. Either one would be fine by me, since they would take me out of state and allow me to do some more research than I would be able to otherwise, and the actual available projects are similar. The last one is a NASA internship, which I am really hoping to get. This works a little differently, as I will be placed at one of my center choices (Johnson, Goddard, or JPL) based on where I fit in best, if I’m selected. I don’t have much more information, but there will be an online seminar in a week or so that should clear up some questions. This past semester, my hardest yet, wasn’t exactly my best. I didn’t take one of my classes as seriously as I should, probably because it was optional for my degree. This year, however, I plan on getting a 4.0 in all of my classes. Yes, this will take a lot of work, and yes, this next semester will take the place of “hardest semester yet,” and yes, I will be slightly behind almost out of the gate, but I’m definitely going to try. As for my fall semester, I don’t know exactly what classes I’m taking, but all I really need to decide is my math course(s) (which will probably be Diff-E-Qs and Linear Algebra courses), and I’m golden. If me writing this post at 0416 is telling you anything, I am very much a night owl. All of my classes next semester (aside from my recitation) start late in the day, so I don’t necessarily need to get better sleeping habits, but I would like to. Tossing and turning in bed until 0600 isn’t exactly my idea of a good night’s sleep, so I’m going to try to fix that. Exactly how, I have no idea. Now, I’m not saying that I was a terrible friend for all of 2009, but there were a few bad lapses in judgement. Plus, it’s never wrong to try to be a better person all of the time, right? This is the most abstract of my goals, and it’s one that I don’t even know how I’ll gauge, but I’m going to try. With my MDRS mission less than one month away, and since I’m currently on vacation from school, I finally have the time to finalize some purchases for my mission. As I mentioned previously, I’m buying a sleeping bag, mat, watch, plus some clothes to help cope with the cold temperatures. I’ve also started mentally preparing a To Pack list and have organized many of my clothes based on what will travel with me to the Hab. Things like long-sleeve shirts and sweatshirts will be the bulk of my clothes, plus some State things, sweatpants, and the essentials (socks, boxers, etc.). Thankfully I should be able to fit everything I need in one bag, plus some “luxury” items in my backpack, which will make my flights that much easier. I’ve also lined up actually paying for the mission. Currently, our crew has a ChipIn! account set up, which you can access via our crew blog. 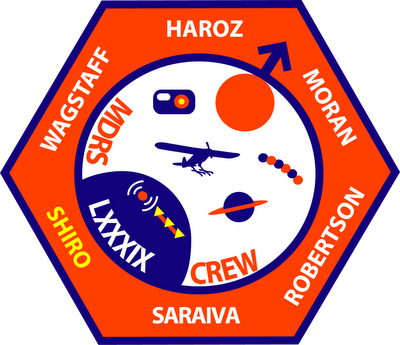 That fund will help to mitigate our entire crew’s cost or, at the very least, pay for our mission patches once we order them. In any case, every dollar you donate there will make it that much easier for us. I’m not exactly sure if the donations are tax deductible, but I also didn’t set up the ChipIn! account so I’m not the best person to ask. As for my portion of the crew fund, I received some good news: I’ve gotten a Matching Funds Grant through the Mars Society! Thus, they will be paying half of my fee, so I only have to dish out $500 for the trip. Pretty nice, right? One of the only things I need to do in return is give at least five talks over the course of the year after the mission about my experience. I already planned on attending the UURAF at MSU this coming spring to showcase my research, so now I only need four more. I’ll probably talk to the SPS officers about giving a presentation during one the meetings, as well as my old high school, Lyman Briggs, and some other close-to-home places. I may even take a road trip to some other colleges! These talks shouldn’t be too bad. If any part of being a member of Lyman Briggs is more ingrained than verbal presentations, then I didn’t learn anything. Freshman year, I attended the UURAF to present on the dissipation of volatile elements during the aerogel capture process of NASA’s Stardust mission, gave presentations on hydroelectric power and the ecological properties of the Red Cedar River (specifically the effect of the duck population near the main Library), along with countless smaller presentations in class. I had to give a verbal presentation every few weeks as part of my Cystic Fibrosis research. I’ve been a Calculus LA for three semesters (my fourth will be this coming spring). I gave two long presentations on specific areas of climate change this past semester. I’m sure that there are a ton of others that I am forgetting, but the point is that five presentations will not be bad at all. Getting to them, however, might be a different story. In other news, I have yet to send out some e-mails to The State News for a news story and a couple professors for reference letters for my internship applications. There’s been so much going on, especially the last few weeks, that everything has sort of molded together, but now that I have a chance to breathe, things should go a little more smoothly. I do only have a week before I’m back at school, with classes starting a week after that, so I need to get this stuff done soon. But not before I eat. For the past week, I’ve been in finals mode. I purchased two bags of peppermint patties to bribe myself into studying (I would eat one for each full hour of studying I completed). I crammed for four exams, worked on two papers, slept for a total of maybe twenty hours, was a recluse in my old dorm’s study lounge, became very irritable after ten-plus hours of studying straight, tried to retain my sanity, walked in the cold of Michigan winter mornings (where I classify morning as 0300), carried books and notebooks all over, read myself to sleep with Quantum Mechanics, used my Astrophysics book as a pillow, copied down entire pages of my Abstract Algebra book, worked through dozens of problems for Classical Mechanics, read more research papers on alternative fuel sources than I can count, and downloaded a copy of one of Feynman’s books and read it in a single sitting. I got back from my quantum final around 1400, sent in my final paper for HPS, and I was done. Done. I played guitar, I read a book (Red Mars by KSR, but I’m only about 100 pages in), I ate some food, and I checked my e-mail. Now, finals is one of the unhealthiest times of the year for me, since I don’t really sleep or eat, so I won’t even discuss those issues. Even with all of the work I put in, I still enjoyed myself and had a good time. Part of that is probably due to the fact that I leave for MDRS in 37 days, part of that is that I was with my friends for basically the entire process, and part of that is due to the fact that I was done on a Wednesday afternoon instead of a chilly Friday morning. I’ll be the first to admit that I didn’t study non-stop. After my two finals on Monday, I didn’t study at all. I came home, showered, had some food, went out to Bubble Island with a few friends, then watched Event Horizon and some GSN. I spent Friday evening doing almost nothing after revising my quantum paper, plus I watched the new Office episode that I had missed due to studying the night before. I even relaxed a little bit this morning after waking up way earlier than I had planned and finishing some last-minute studying. Everything just seemed to fall into place, well, almost everything at least. This might have been my least stressful finals week, even with my highest number of semester credits, ridiculous classes, friends’ drama, my own thoughts, and tons of other things. I seriously don’t know how it all worked out. I even have a ton of peppermint patties left over, telling me that I could’ve studied more if I needed it. But I didn’t! I don’t know what changed from previous years, but I felt like a well-oiled machine simply going through the paces. This morning at 0719 EST while standing on my balcony and drinking a cup of coffee out of my Battlestar Galactica mug, I watched the International Space Station zip overhead. The pass was scheduled to begin at 0716, but due to clouds my roommate and I couldn’t see it until it was near the zenith. This was my first time watching the space station pass overhead, which may be surprising for some of you, considering what a “space nut/enthusiast” I am, but there is a reason for it. 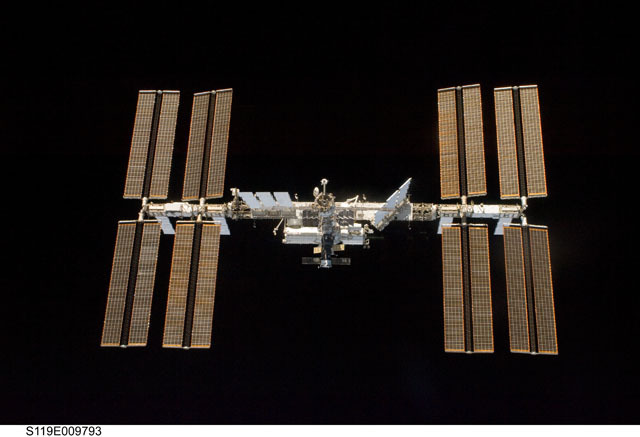 The ISS has had a continual human presence aboard since November 2, 2000 and has been in orbit since 1998. That’s 3325 continuous days with humans in outer space, a time duration that’s increasing constantly. I would hope that, should events pan out in a timely manner, that November 2nd may become known as “Space Day” or something similar to commemorate the start of our extended and continuous reach away from our cradle. So, why haven’t I taken the time to look at this marvel? Well, early on, I didn’t think that I would be able to see it. It had a low luminosity until the main solar arrays were added, I don’t own a telescope, and I lived near a major city with a lot of light pollution. As time progressed, I couldn’t find the time to take a look, plus I wouldn’t know when to stand outside and try to see it. Then, last semester, I was introduced to Heavens Above, a great site for locating man-made objects (and some natural ones) in the night sky. Of course, I checked out when the Shuttle or ISS would be passing over, but it was more cursory than to plan a day to actually watch it. So, Sunday night, I decided that I’d actually take a look this Tuesday. The sky was a little cloudy, I had been up all night, and I was drinking coffee with my roommate, but what a sight! I didn’t really think that taking a look at a bright dot streak across the sky would mean so much to me, but it did. I was completely geeked, and I immediately afterward checked out when the next prime passing is (Thursday around 0630 EST). I didn’t think that I could be more excited about space since learning about my MDRS selection, but I was. Funnily enough, I started thinking back to the last time I was extremely excited about something involving space, and I remembered SpaceShipOne. I’m sure that you all know that SpaceShipTwo, the first commercial space plane, was just revealed to the public, which is extremely exciting in of itself, but this is about SpaceShipOne and the Ansari X Prize. I was in my freshman Biology class in high school, and each week we had to find a current event article about something in science each week. Most of mine were about the quest for the Ansari X Prize and the creation of SpaceShipOne, although I did have to look at some other articles from time to time. The prize wasn’t awarded until about a year later, but I was excited! I figured that becoming a commercial astronaut would still be pretty sweet, plus I’d probably be able to go into space much more frequently. When the Discovery Channel debuted Black Sky: The Race for Space, I spent the entire day watching it… Twice, in fact. It was just so cool! And now, what’s next? It’s been 37 years and 1 day since the last manned mission to a location outside of NEO was launched (Apollo 17). Commercial suborbital flights are a year or so away, the ISS will be up for a few more years, I’ll be finishing up my undergraduate and graduate educations, and then I’m free. I almost have a need to go into space now, and every day just puts me one step closer to actually achieving it. The future’s going to be bright, much brighter than -3.5 mag. Images courtesy of NASA and Scaled Composites, respectively. As of last Friday, I am seven weeks away from leaving Michigan to travel to the Utah desert for MDRS 89. Seven weeks isn’t that much time, and when you consider that I’ve only known about my selection for the crew rotation for roughly six weeks, I figured that it was a fitting time for another update. And what better thing to talk about near the holiday season than shopping! I’m still undecided on what type I’ll be getting, and I will be getting a new sleeping bag due to my height and the fact that all of my family’s sleeping bags are getting old and worn out, but I’ll probably be getting a Coleman brand one. Since I’ll have this sleeping bag for a while, I’m leaning toward an extreme weather one just so that I can use it anywhere. I have it narrowed down to two prime contenders, but that could easily change once I actually get the opportunity to purchase it. North Rim : First choice due to the low temperature rating, low cost, and color. Yes, color matters, since I can be pretty picky since there are so many sleeping bags out there that I could pick from. Diamondback 10 : Lower temperature rating, slightly more expensive, but it has a higher ceiling on maximum height… Tough call. Need a new pair of these as well, and I don’t even know where to start. I don’t think I can pick a pair based on online descriptions, so until I actually get to a store I won’t even start thinking about them. If anyone knows a good brand, I could refine it that way, but down to a specific type, no ideas. Required for EVAs. I haven’t worn a watch since the second grade. I’m thinking about getting a Timex, just because of what I remember from my Cross Country days, but this is up in the air as well. I’ll probably end up just getting the cheapest one that tells me the time, since I will almost definitely just be using this for EVAs. I may even be able to scrounge up an old watch from home, but that will need to wait until I actually go home for the holidays. That’s it for the large items. I’ll also be getting some more long-sleeve t-shirts to supplement my current wardrobe, but that won’t be until after Christmas to take advantage of sales and gift cards. No use in spending money that I don’t have, right?